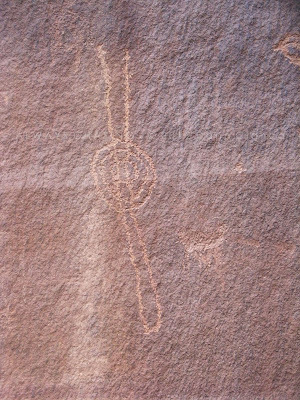 It was a Saturday night after work and I somehow got the idea in my head to drive far away to catch up with some storms that had fired on the Uncompahgre Plateau. 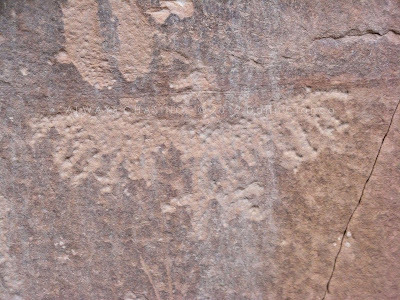 We were in southwest flow aloft and several weak shorties had come through with more on the way. 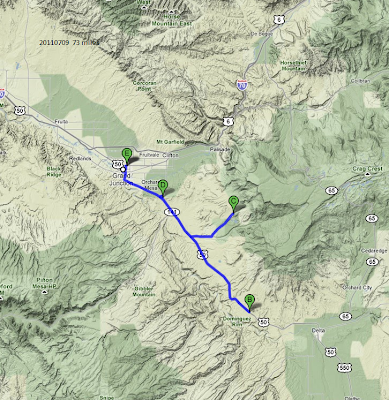 I hauled out of town on US 50 all the way to the turnoff to Escalante Road, just inside Delta County. 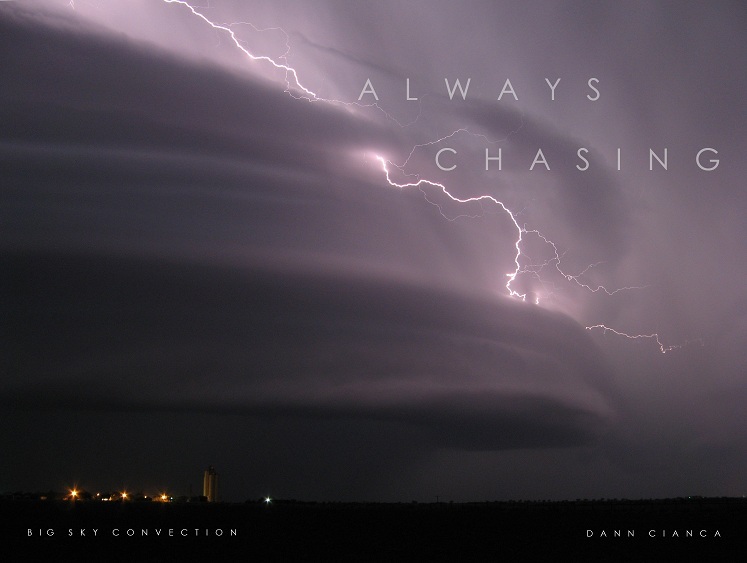 There was a nice lightning show ongoing, but there was also a lot of rain, so I wasn't able to get out and shoot it. 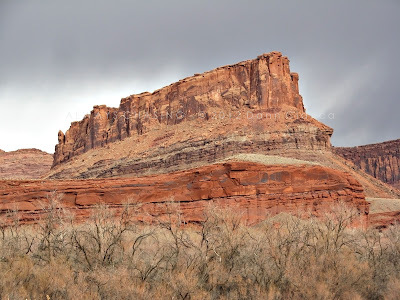 Eventually, the first storm complex waned and I started to head back to Grand Junction. 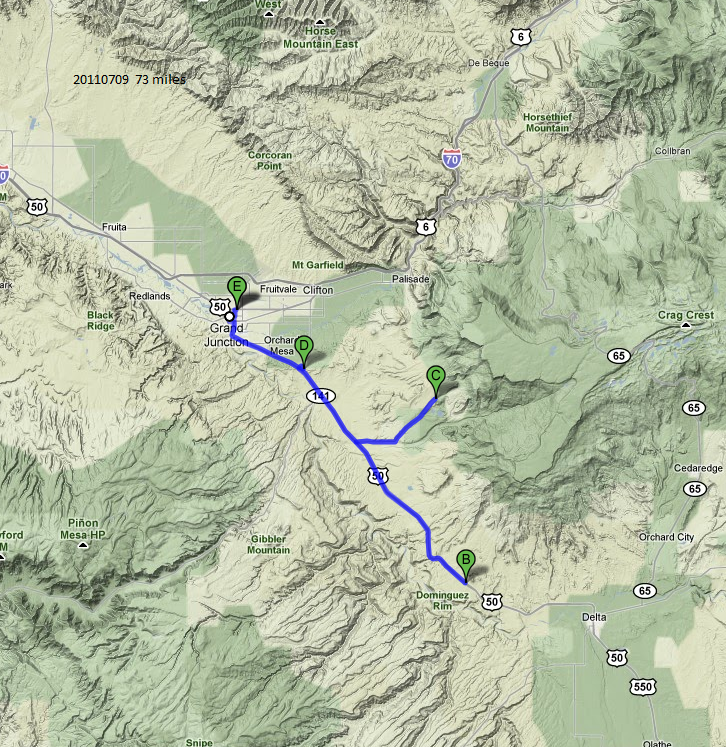 Several smaller cells popped up, so I tried to get a few of them from the western slopes of the Grand Mesa via Lands End Road, but they stopped spitting out C2Gs, so I called it a night. 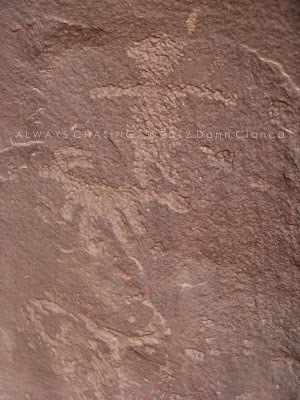 It had already been a full day of adventure, but we weren't done yet. 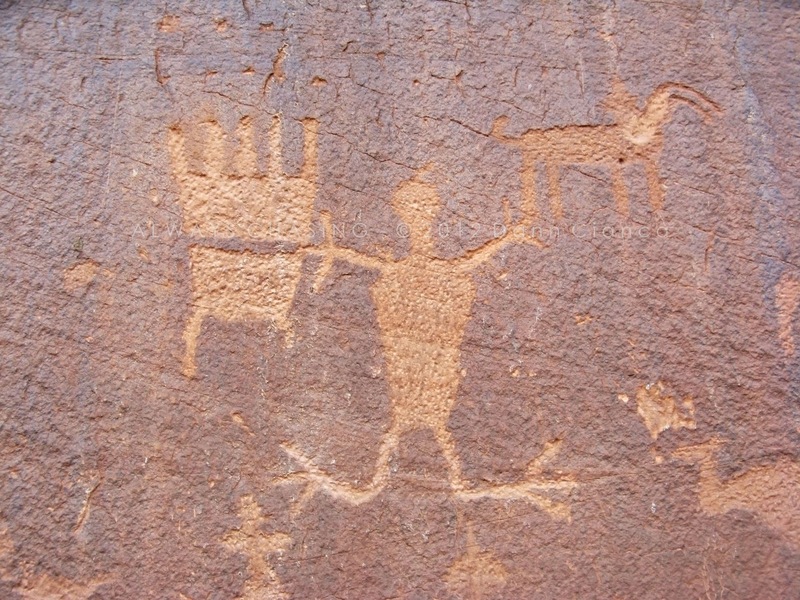 Just to catch everyone up to speed, my cousin Brad was visiting from Montana and we decided to head into Utah on this particular Monday. It had been a cool morning with even a light dusting of snow, as seen on our drive through the Richardson Amphitheater Area. 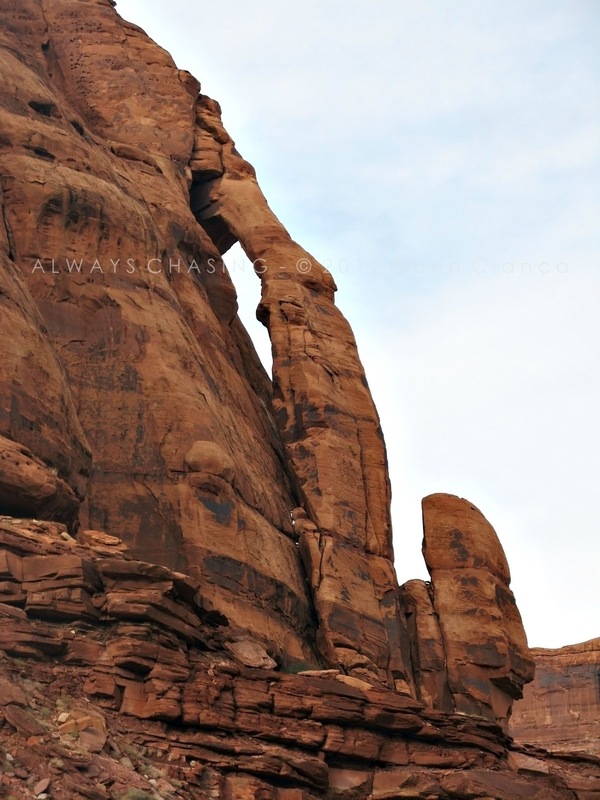 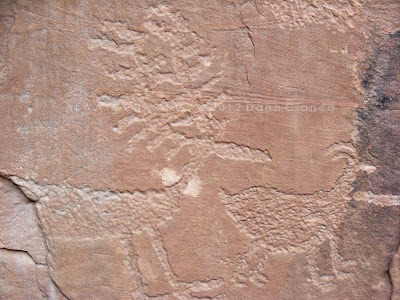 We spent most of the afternoon hiking through the Devils Garden area of Arches National Park, exploring arches and petroglyphs. After that, we decided to drive along the Colorado River and see the results of a storm that had passed. That road is known as Potash Road or more officially as the Utah Highway 279, The Potash-Lower Colorado Scenic Byway. The road is quite scenic, but unfortunately for my desire to take some images of the area, the light was less than fantastic. So, I did what I could. 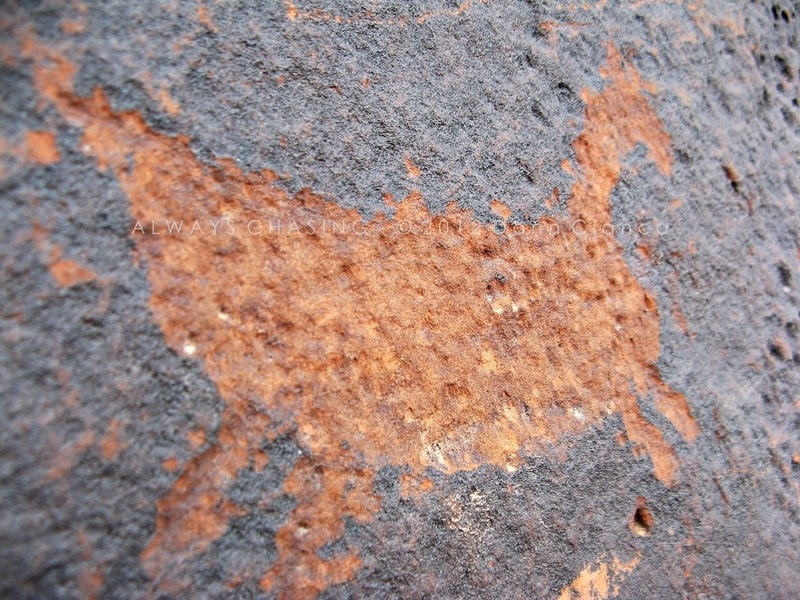 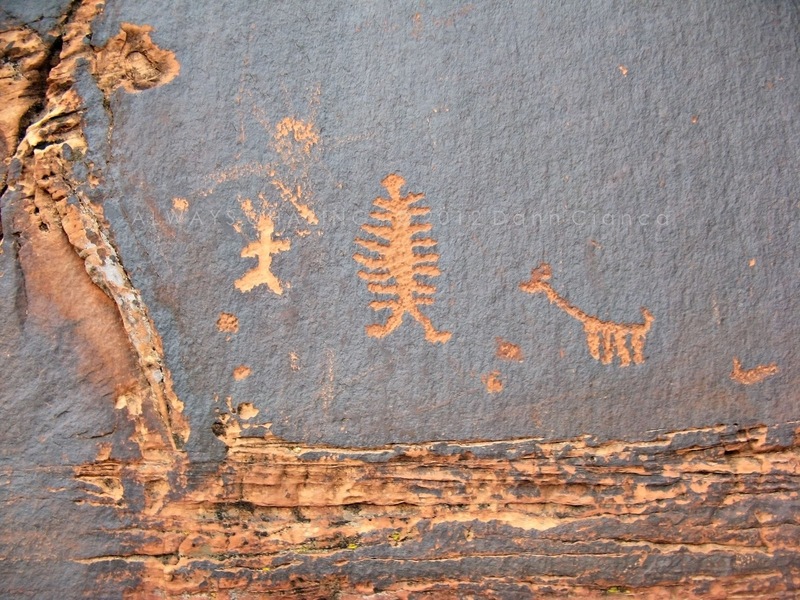 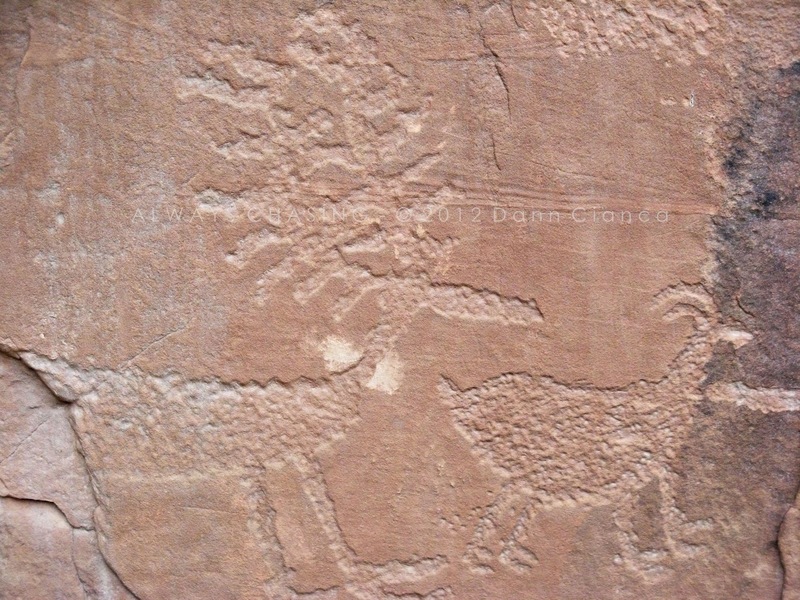 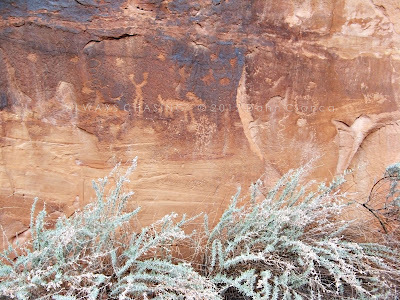 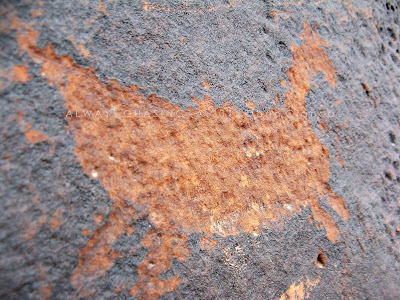 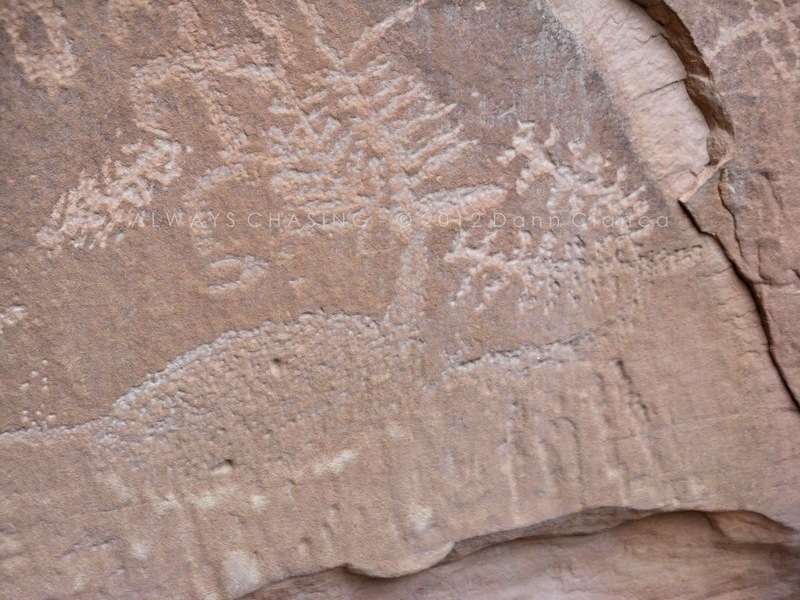 Unbeknownst to me before taking this drive, there are petroglyphs alongside the highway. 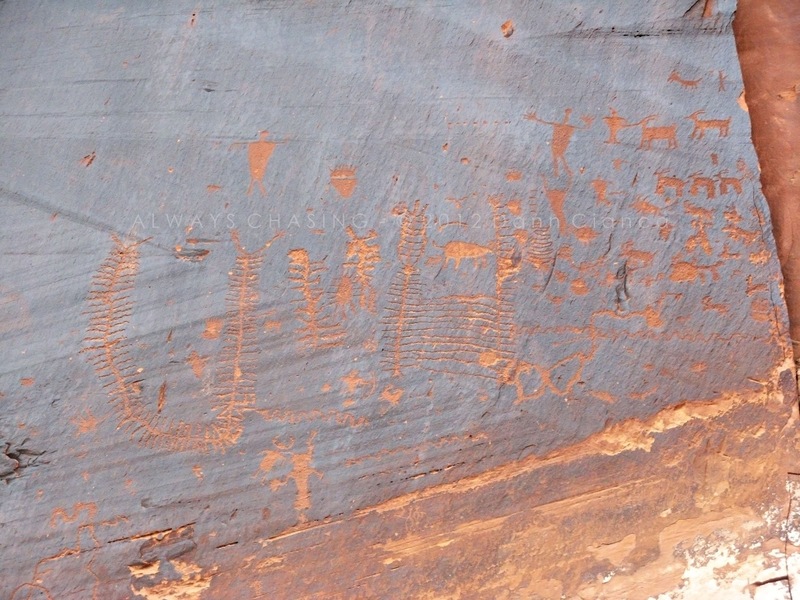 In fact, there are several signs that note "Indian Writings". 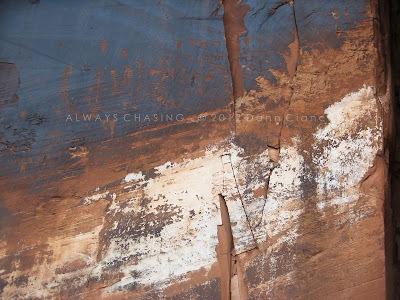 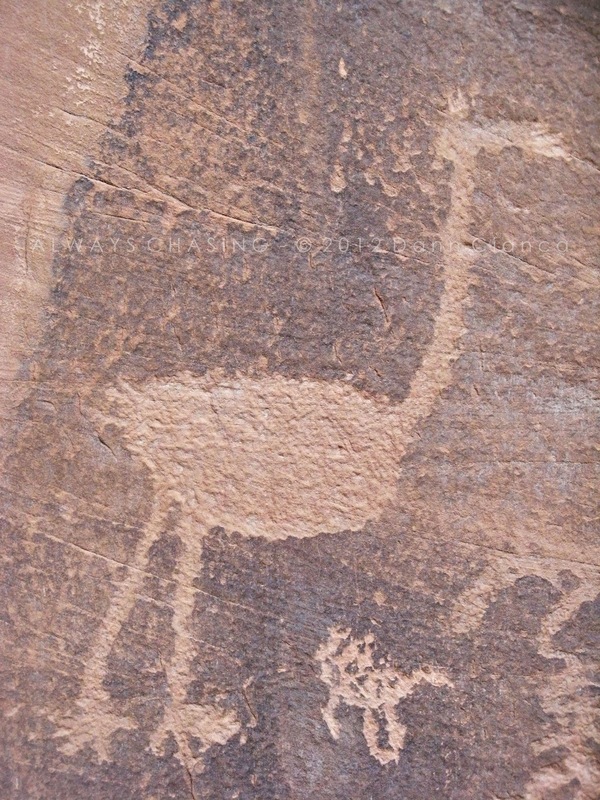 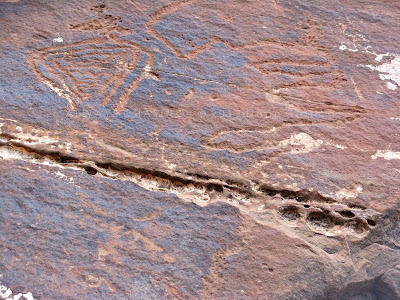 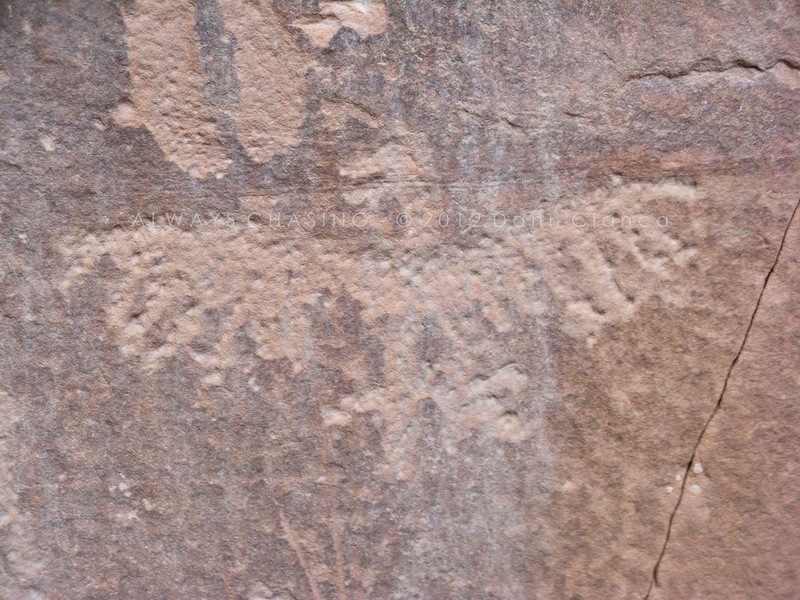 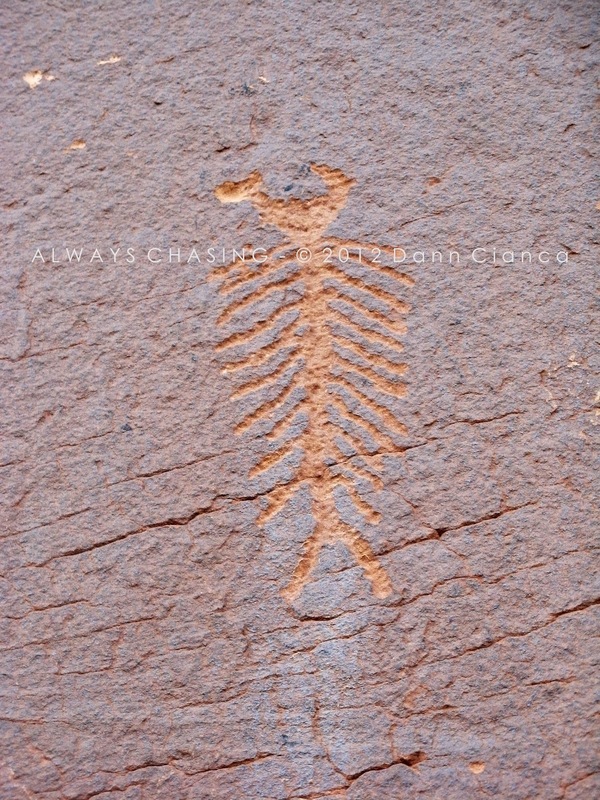 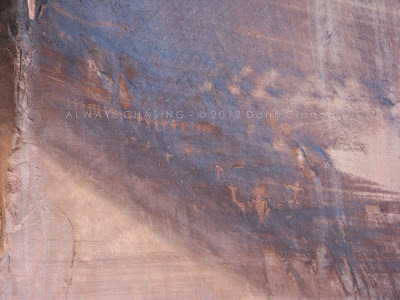 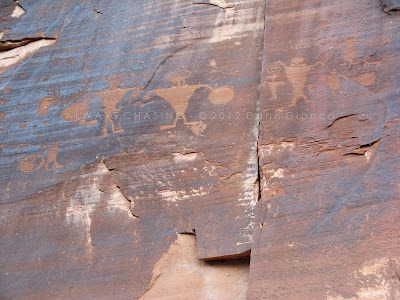 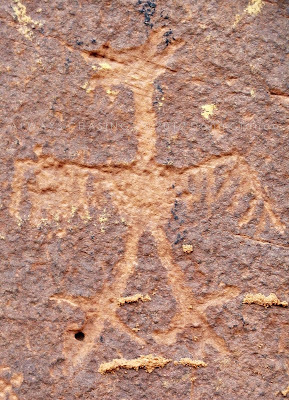 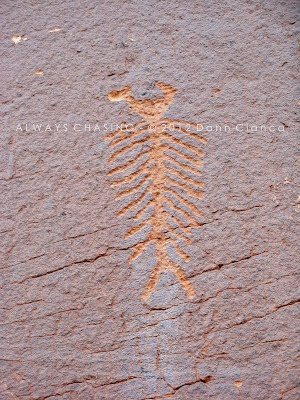 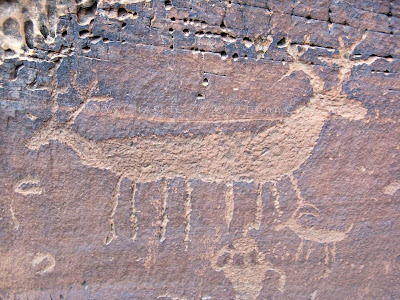 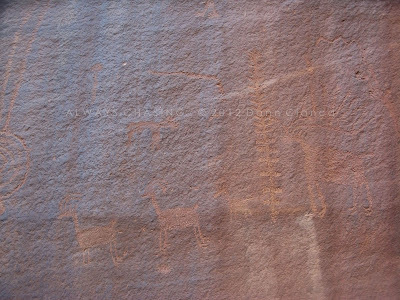 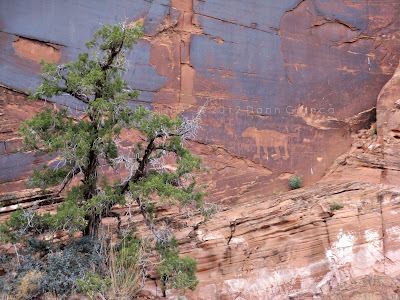 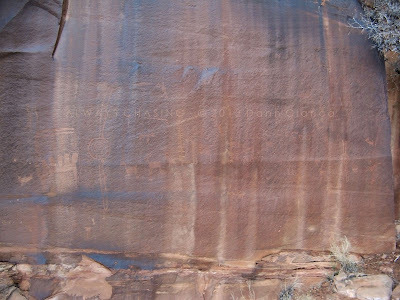 In the days prior, I had encouraged Brad's interest in rock art and we both found ourselves pouring over the canyon walls, looking for etchings. 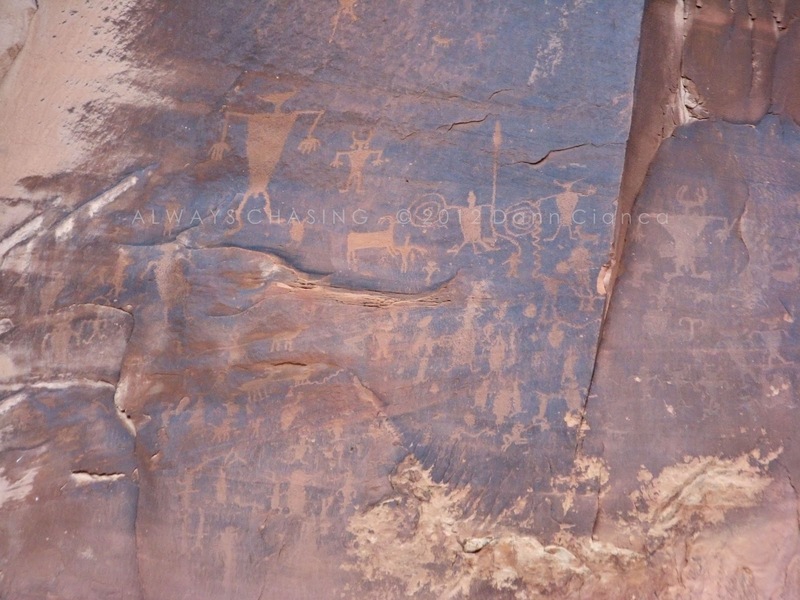 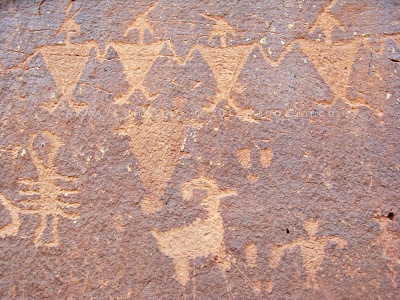 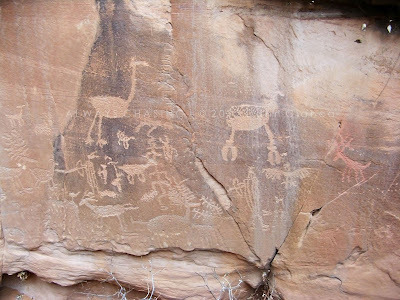 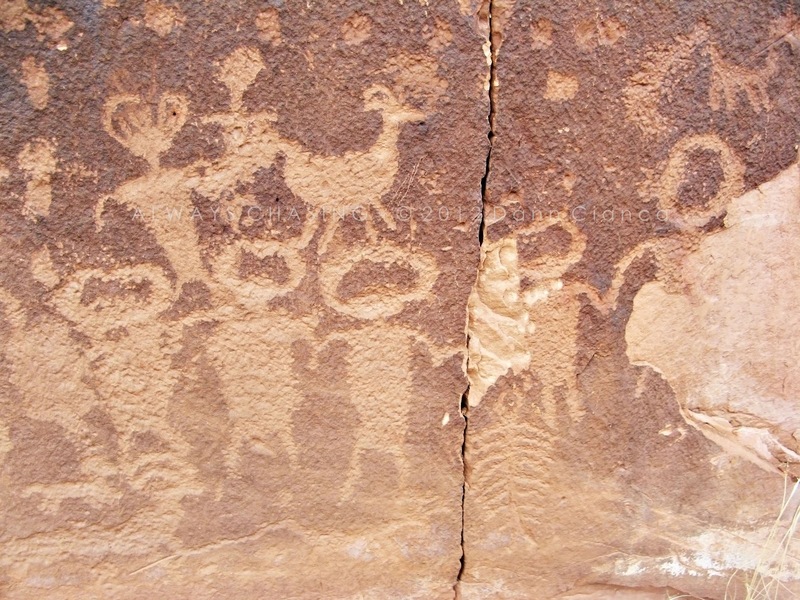 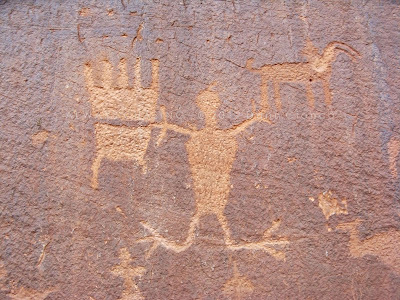 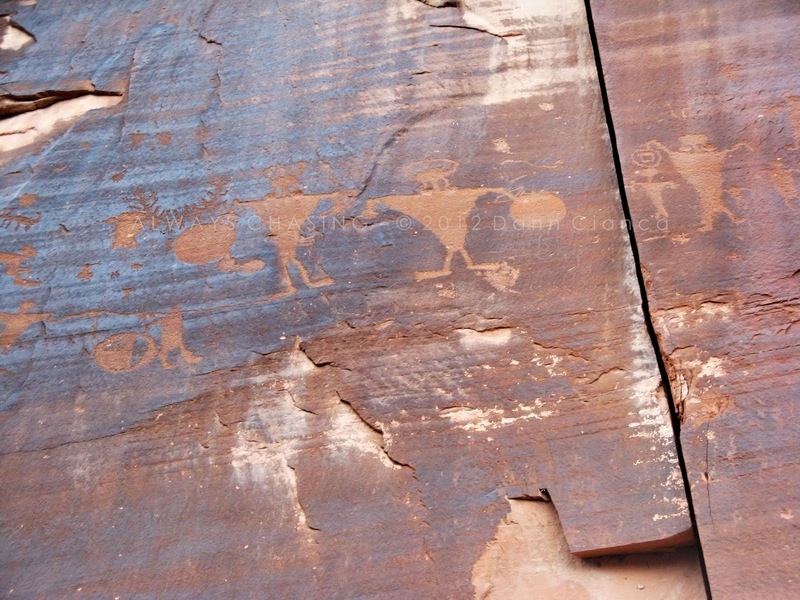 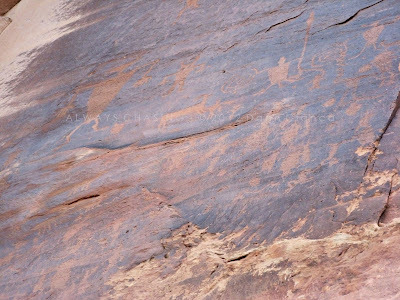 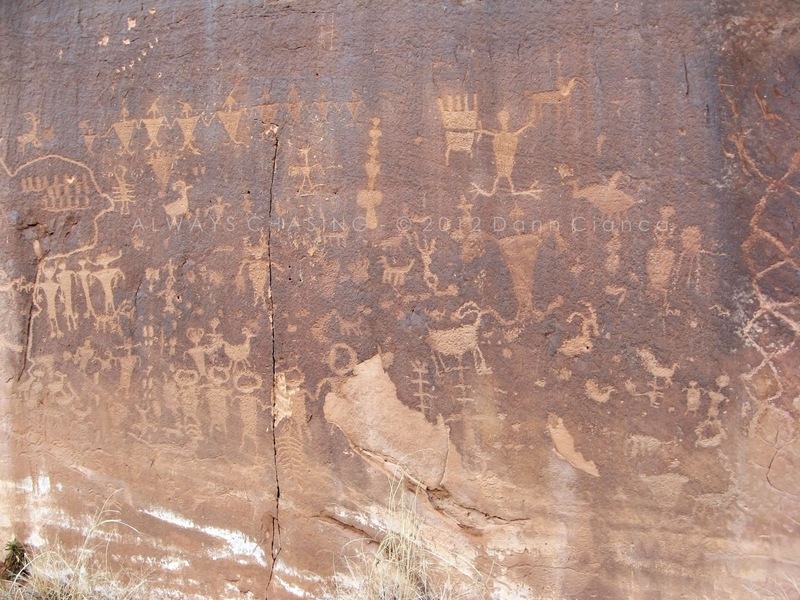 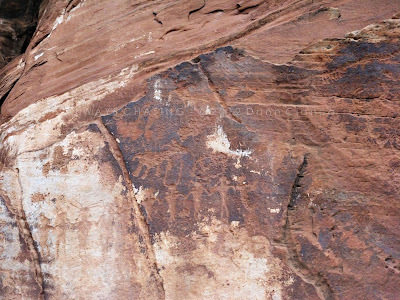 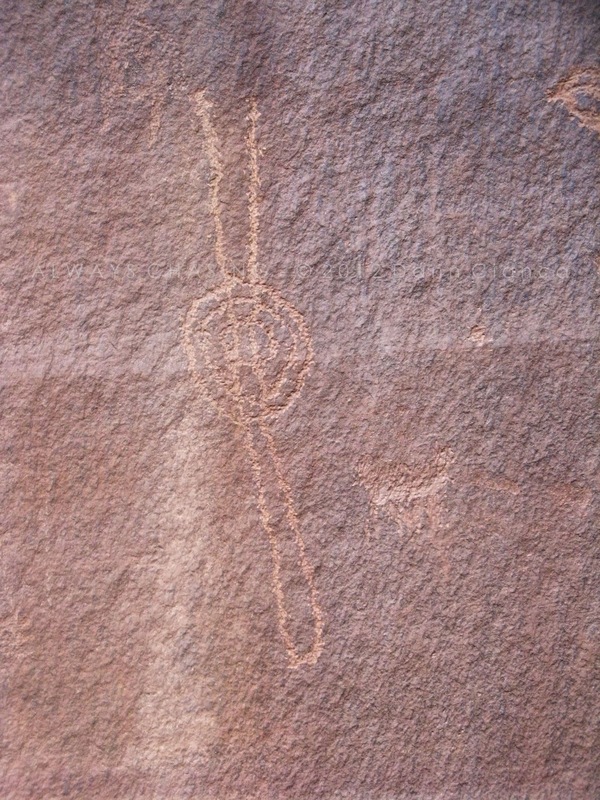 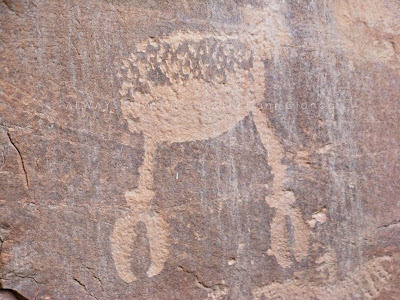 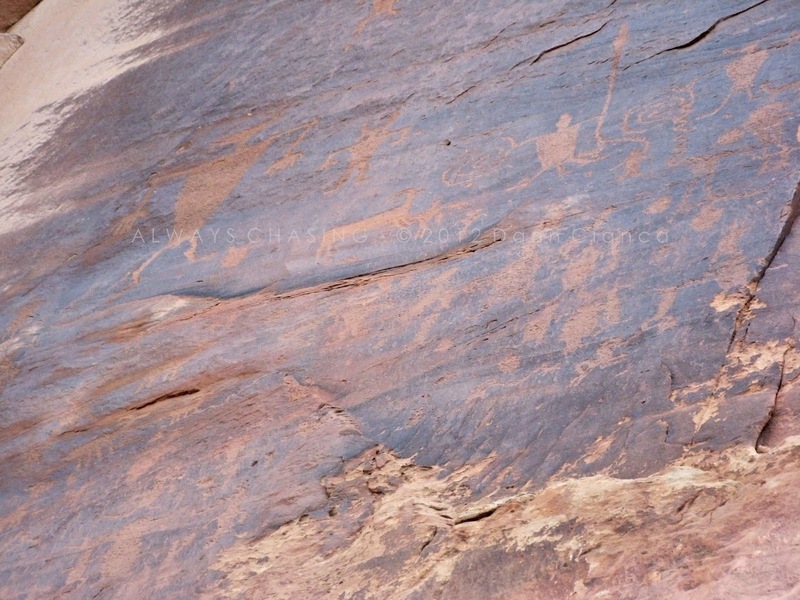 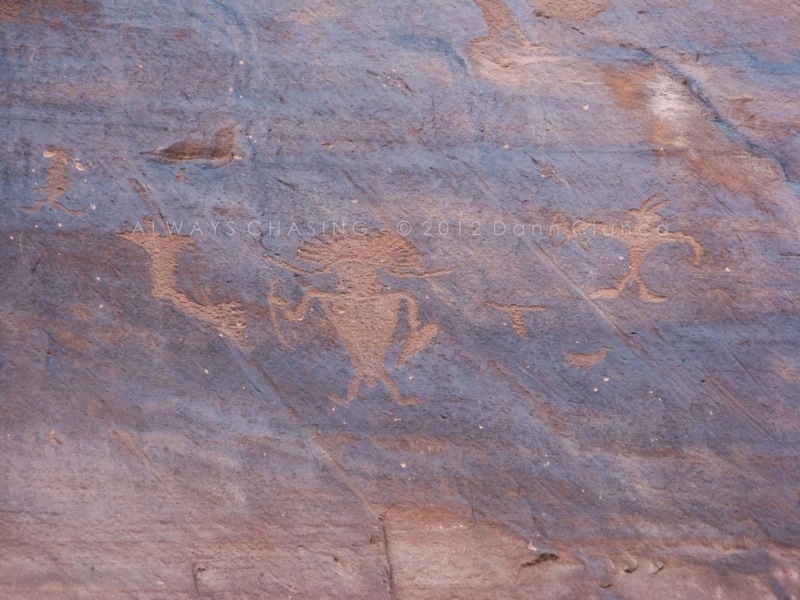 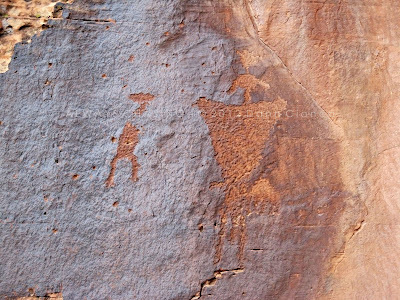 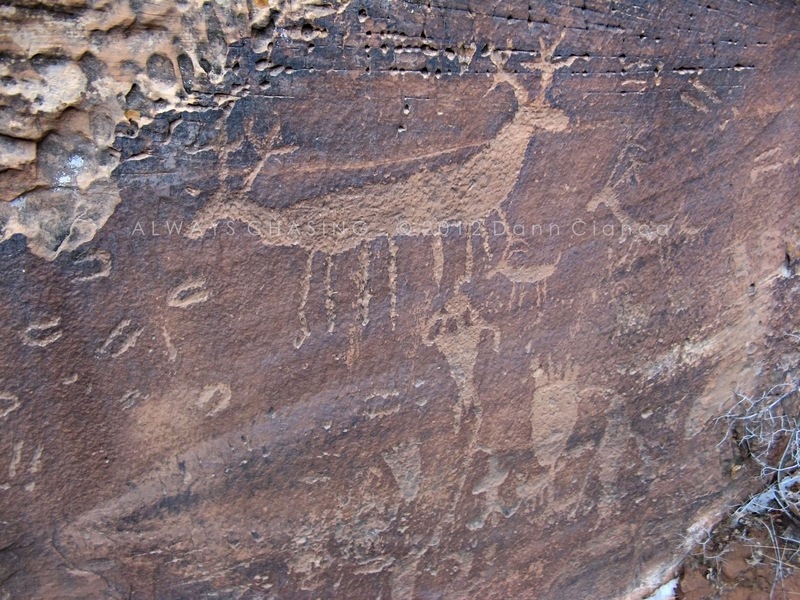 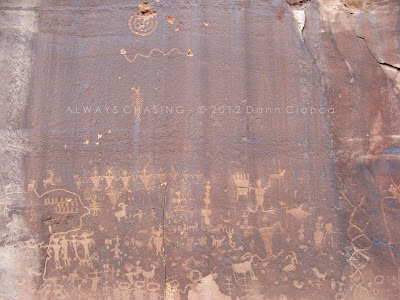 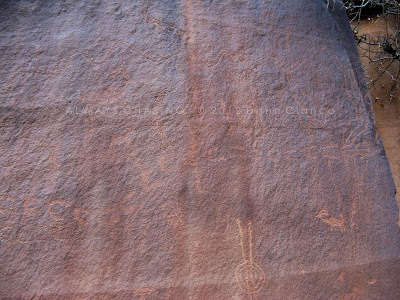 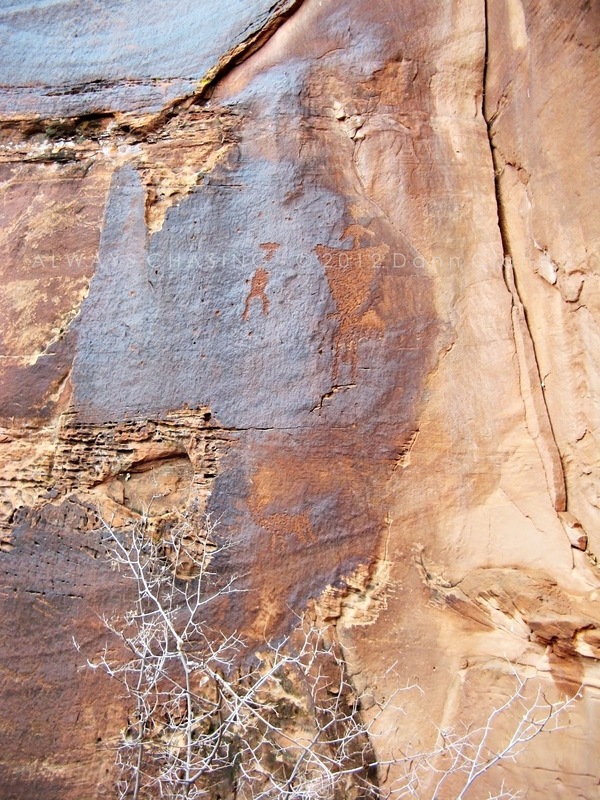 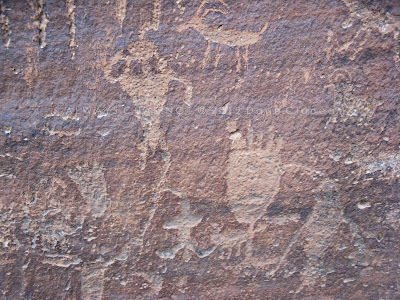 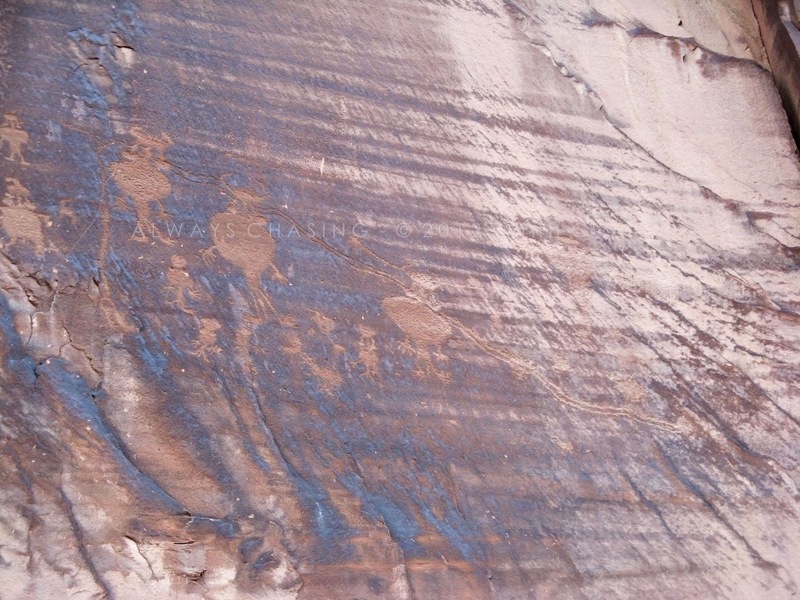 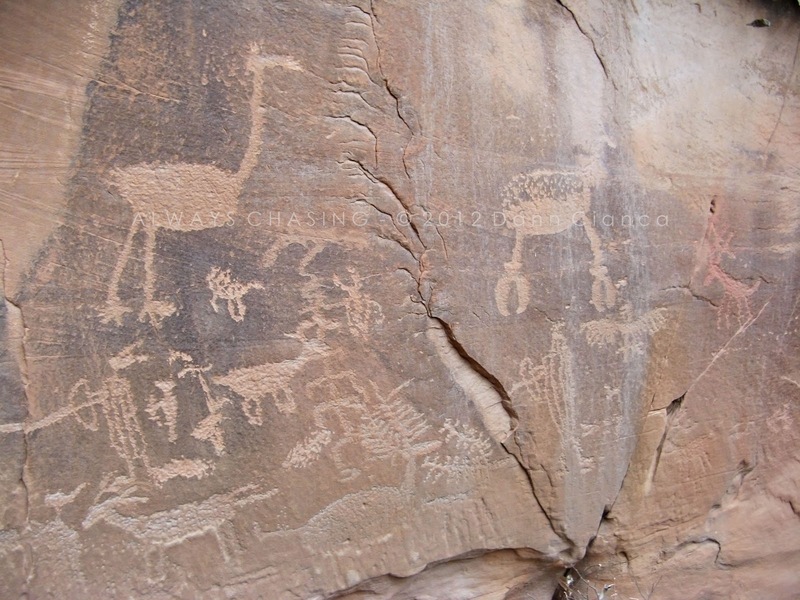 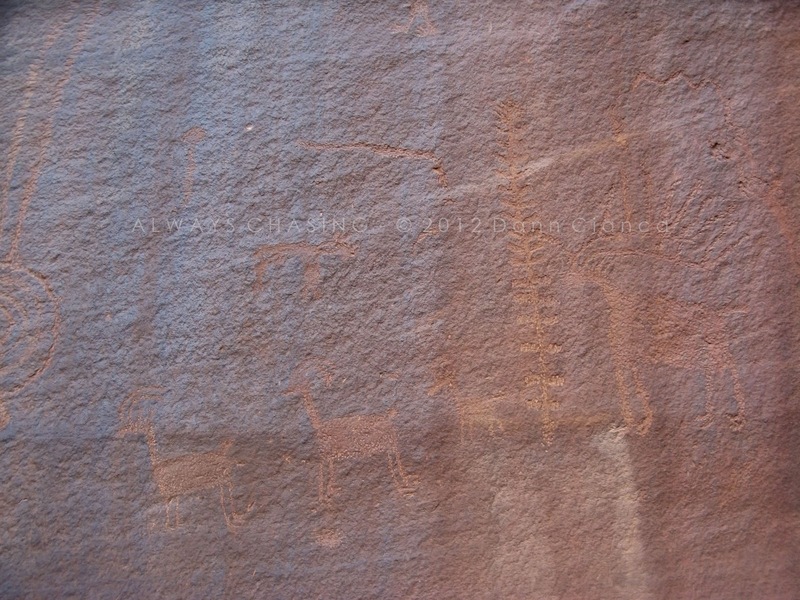 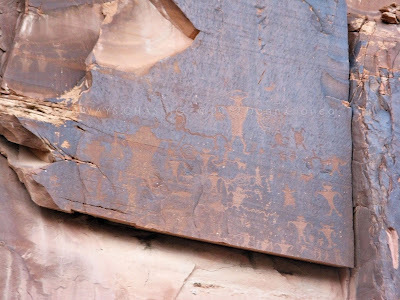 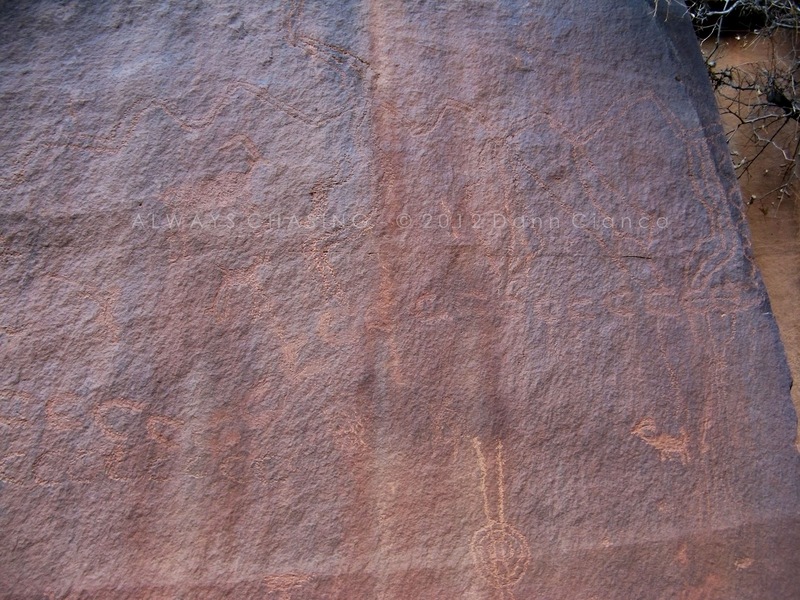 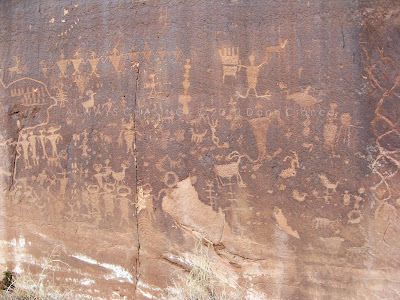 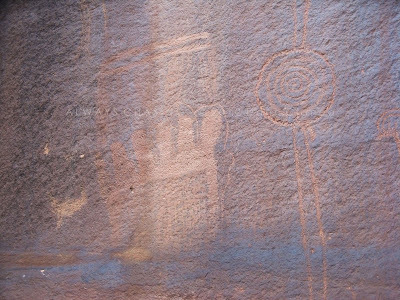 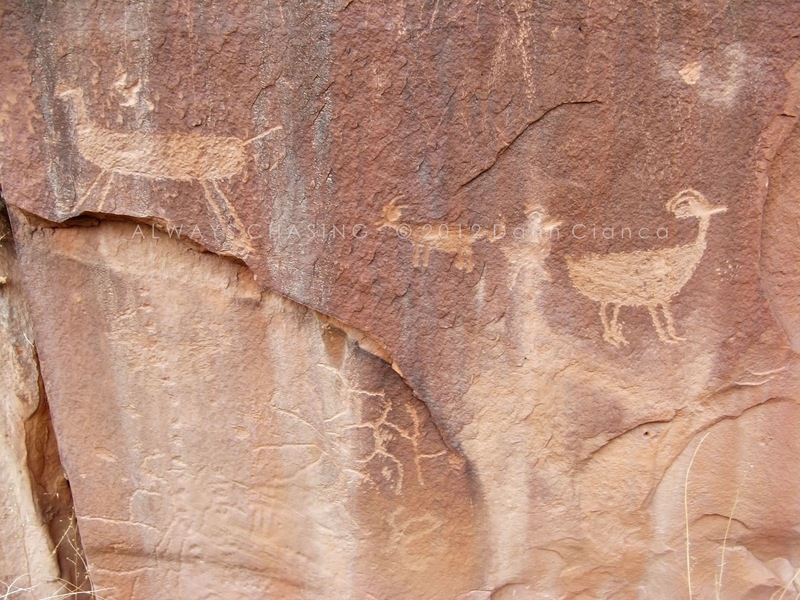 Along Utah's 279, there are many, many panels to be found. The following set of fifty images or so is the result of our exploration, walking from south to north along the wall, inspecting every area we could. 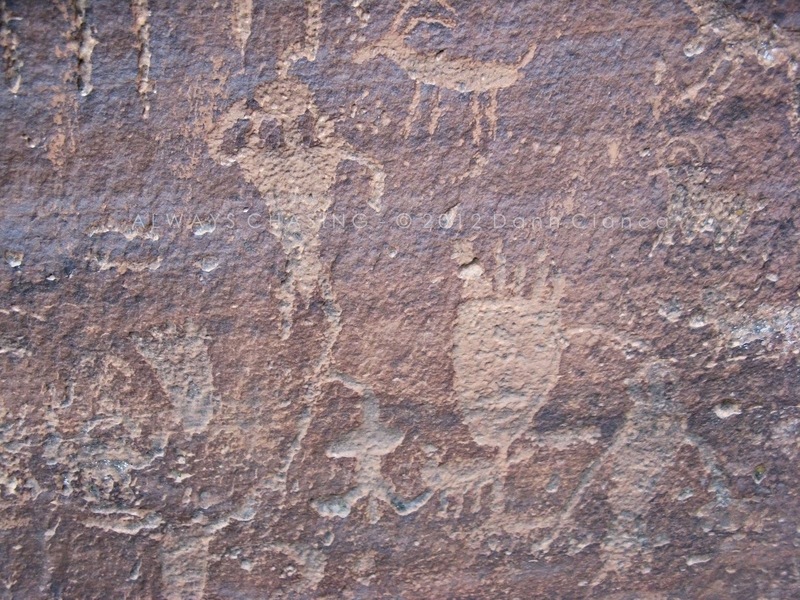 A large panel filled with figures. 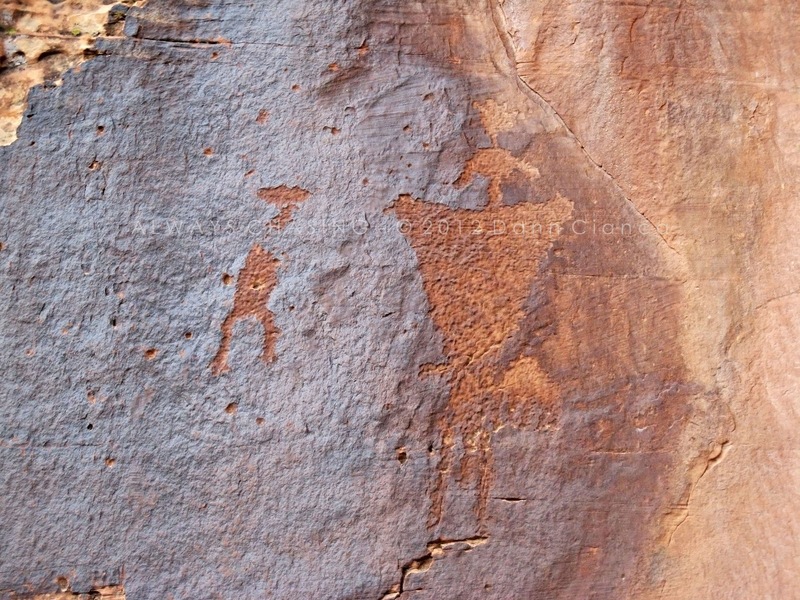 It almost appears as if a man is standing atop something and conjuring. 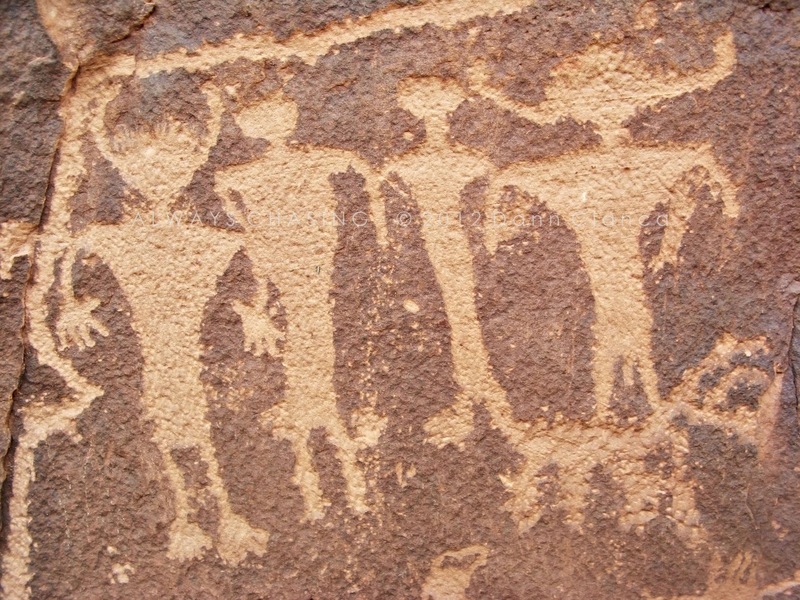 Some graffiti photoshopped out of this one. 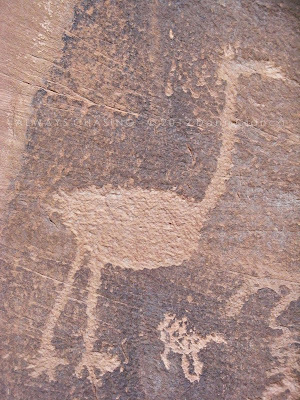 Crane? 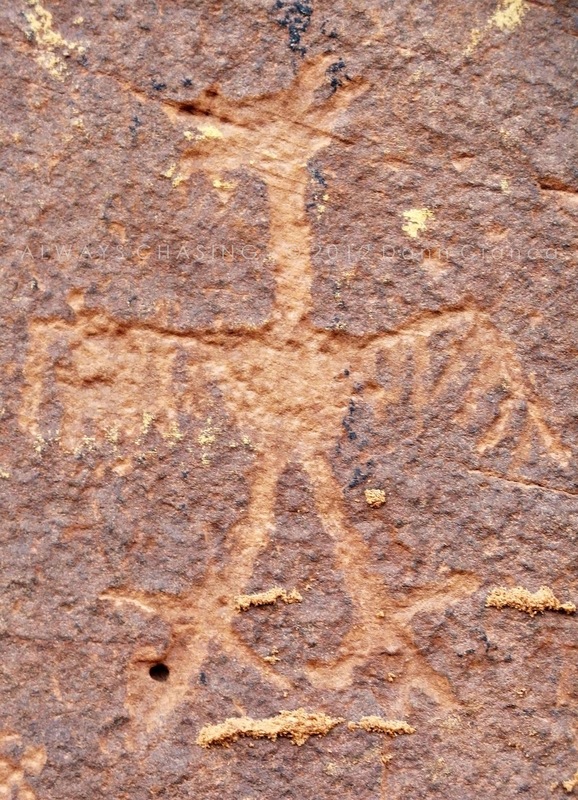 Heron? 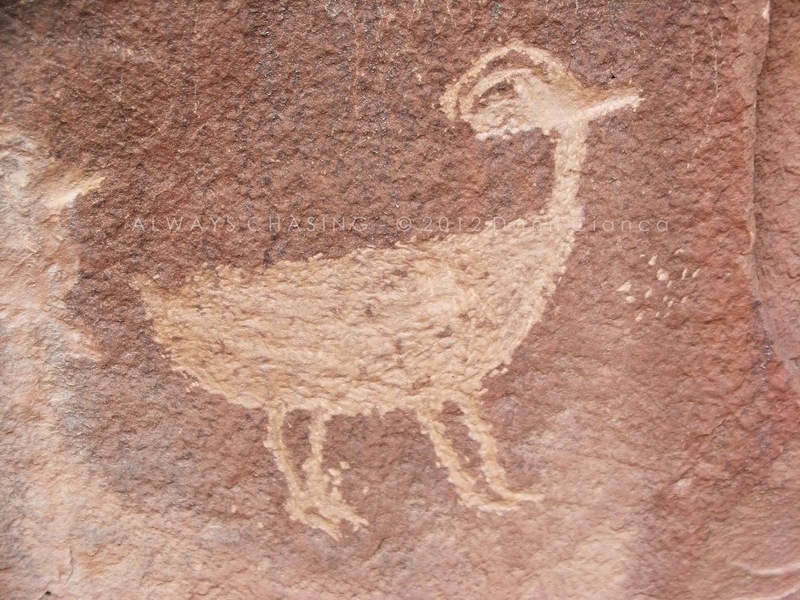 Some other bird, perhaps. 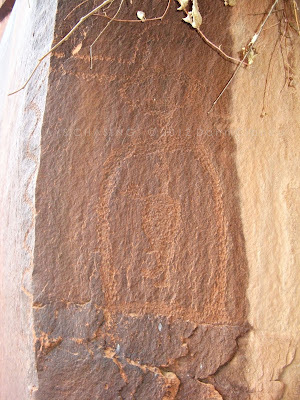 Would love to know what this is. A crab, maybe? 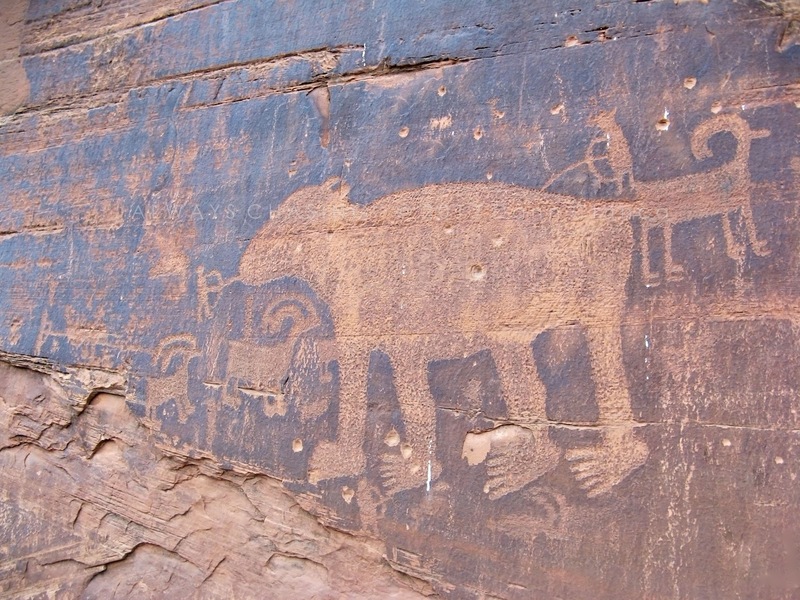 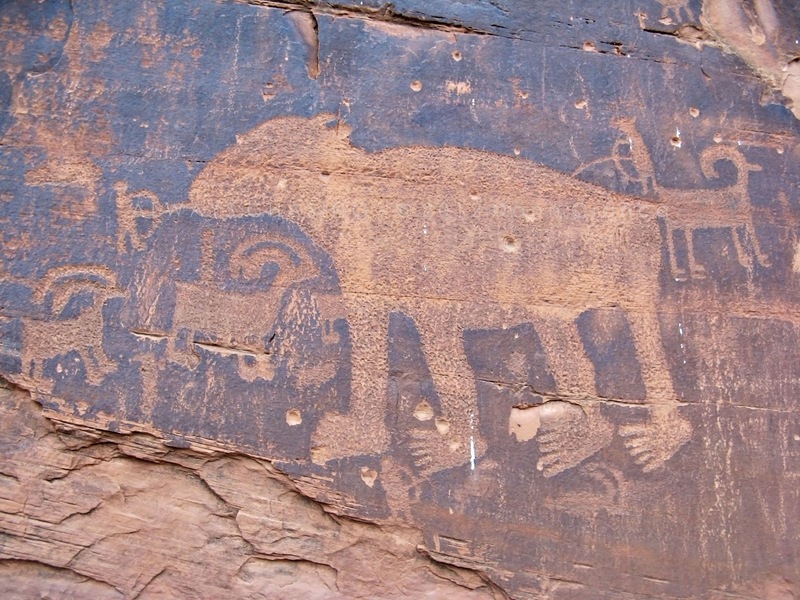 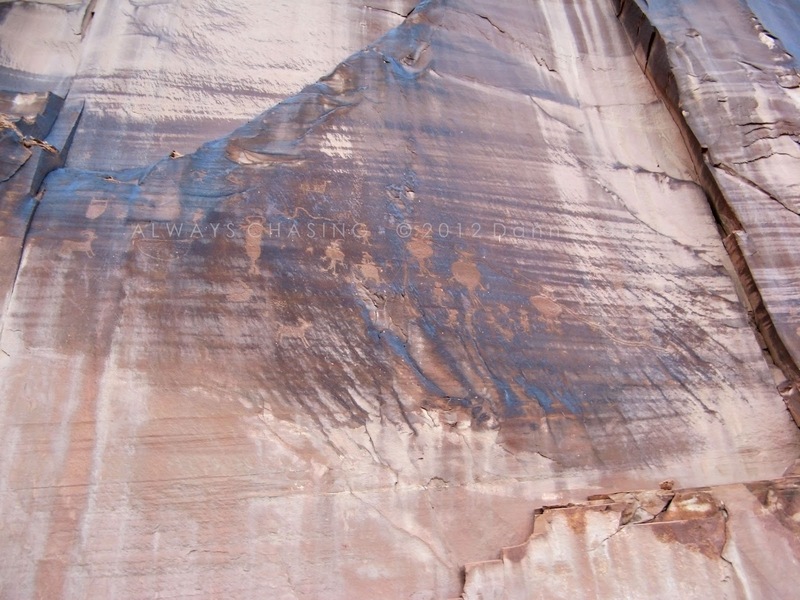 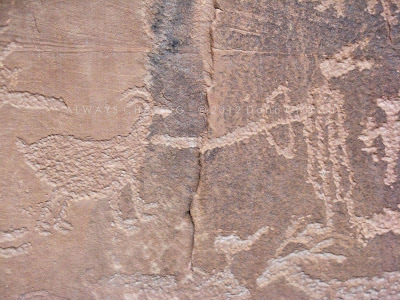 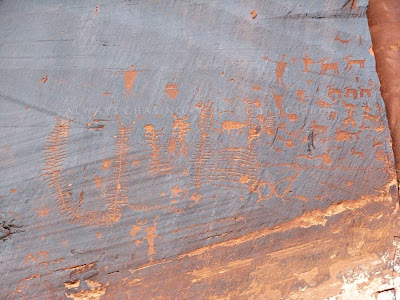 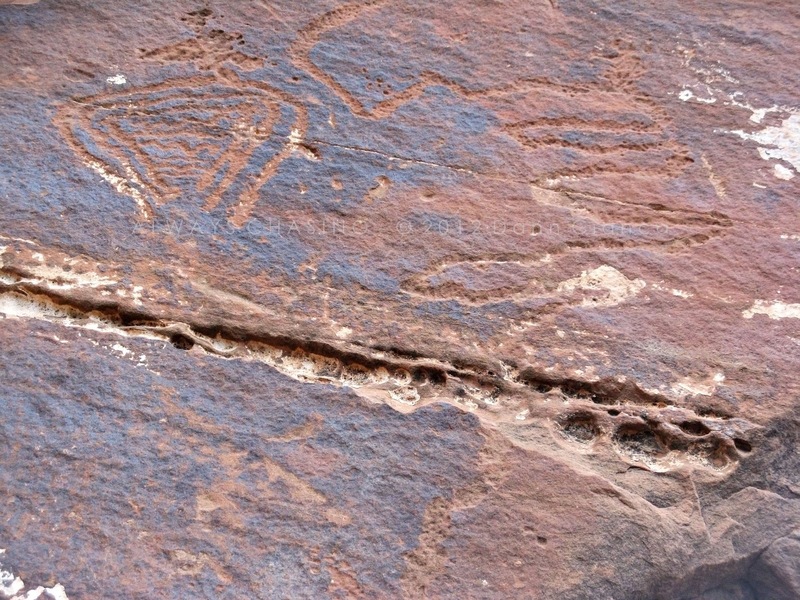 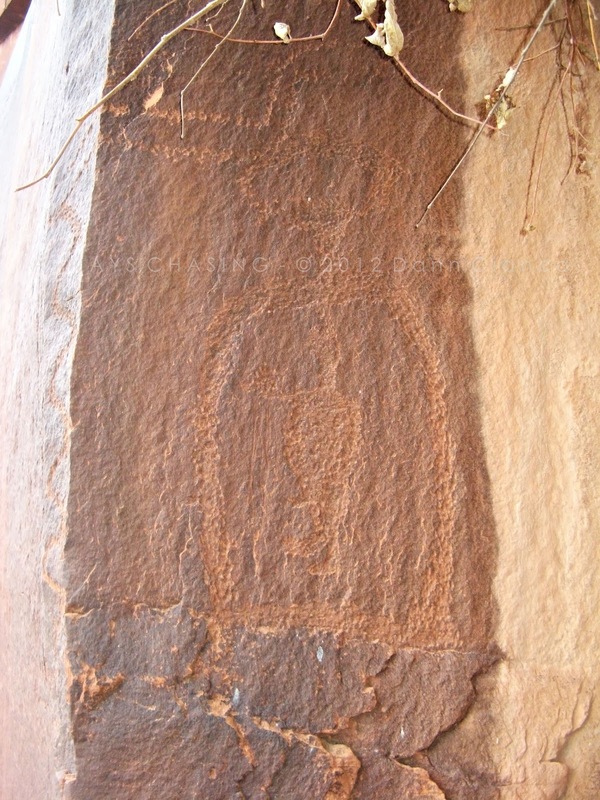 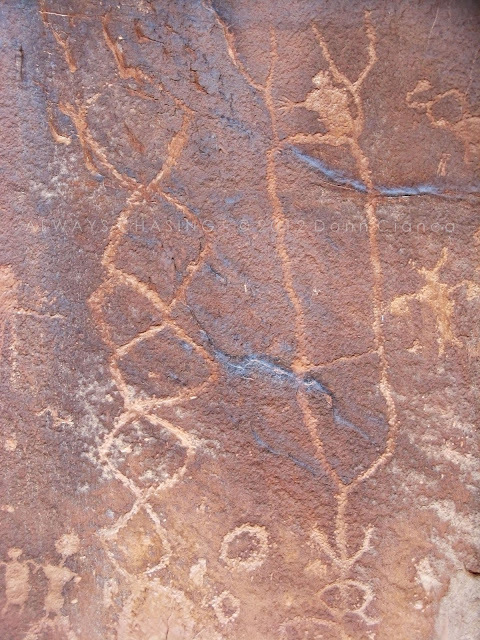 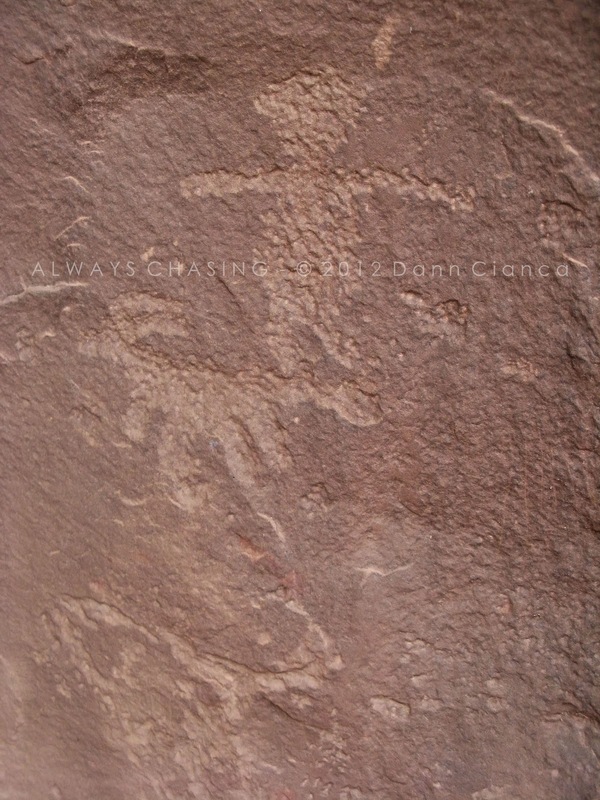 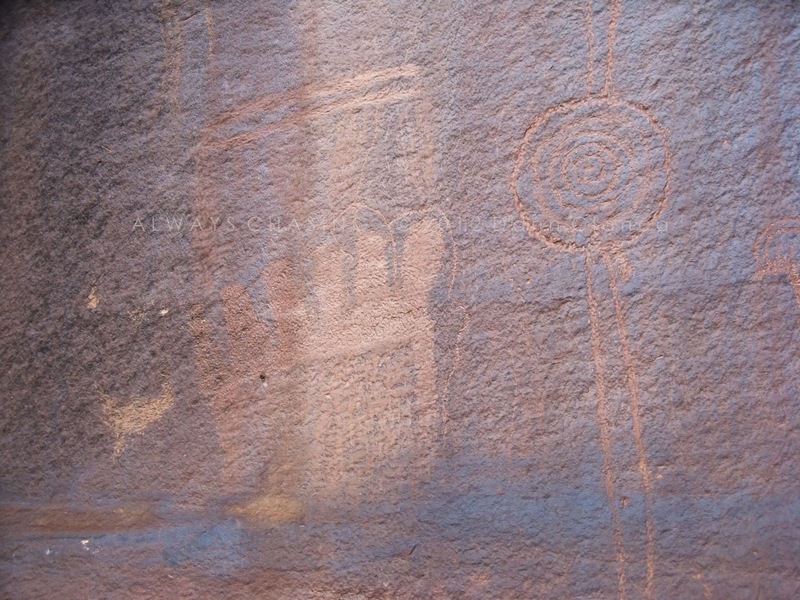 It looks like the bear was carved over a previously existing scene. Also, some of the graffiti is photoshopped out. 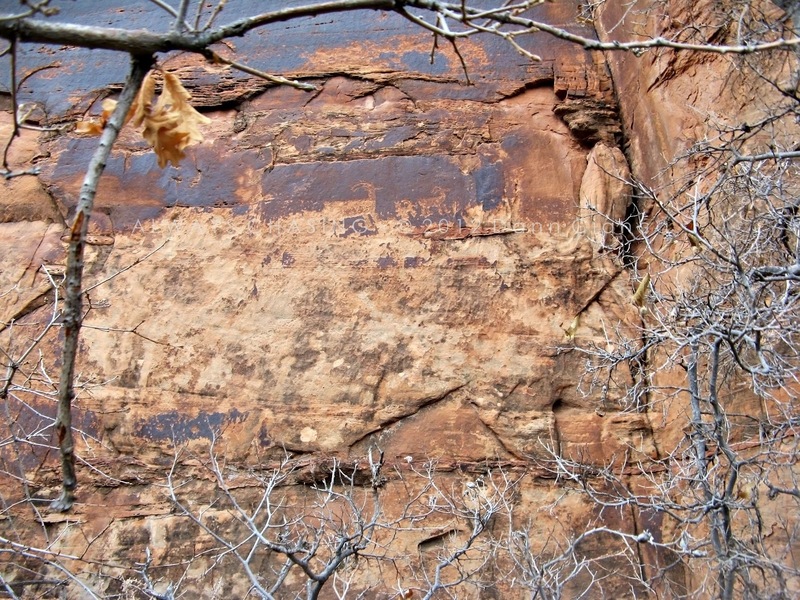 The last ten or so images are of a panel that is about twenty to thirty feet above the road. 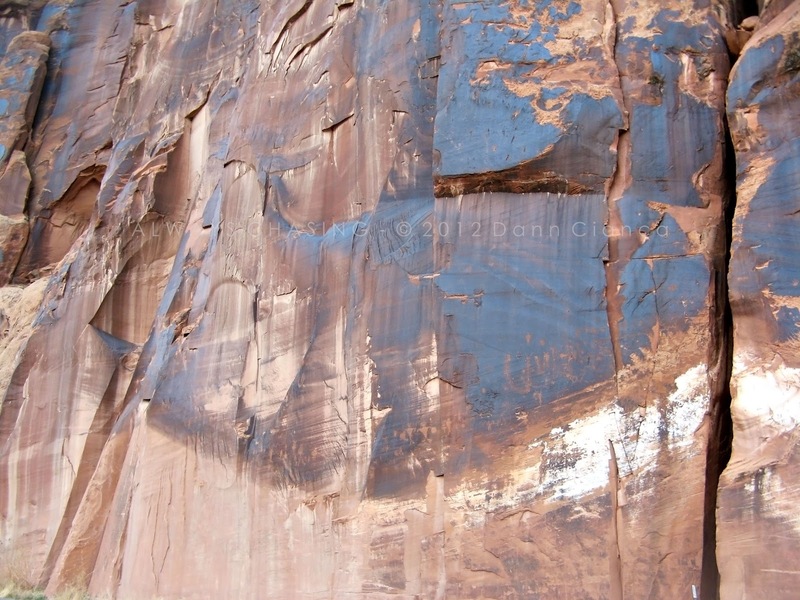 In the last image, you can see where the debris at the cliff-base was cleared to make way for the road. 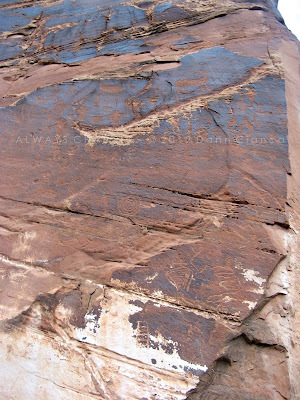 Before the road cut, the 'glyphs were at a normal height. Through the art is well-known, it was a lot of fun to canvas the roadside, looking for figures. 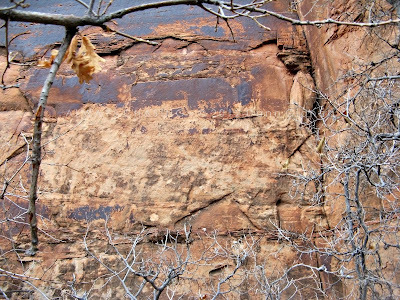 The ground had been soaked with a recent rain and the air smelled absolutely incredible. 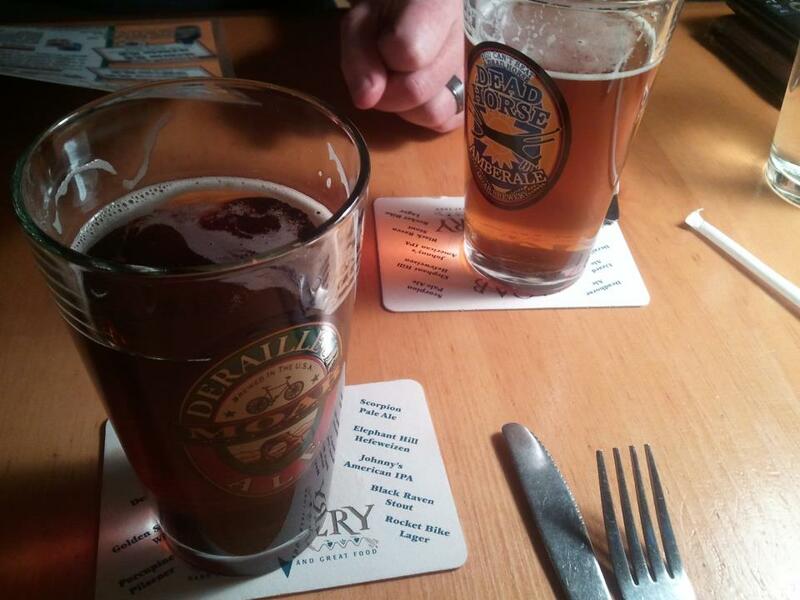 Light failed us eventually and we made our way into Moab for dinner and a beer at the Moab Brewery, which has excellent beer and food, by the way.